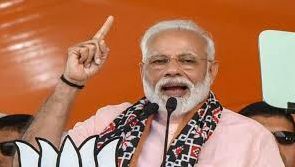 Theni (Tamil Nadu): Prime Minister Narendra Modi on Saturday mocked the Congress’s proposed NYAY scheme which translates to “justice” in Hindi literally and claimed that the grand old party has finally agreed that injustice was done by them over the past 60 years. “Congress and dishonesty are best friends. But sometimes by mistake they end up speaking the truth. Now they are saying Nyay will happen. Even if they did not intend to, they have admitted that they had done injustice for 60 years,” Modi said at a massive rally here. Modi also asked who will render Nyay (justice) to the victims of 1984 anti-Sikh riots; to all the victims of anti-Dalit riots; to the government of AIADMK Founder M G Ramachandran (MGR) dismissed by Congress because one family didn’t like him; to the victims of Bhopal gas tragedy — one of worst environment tragedy in modern India — all of which happened under the Congress rule. “How do you deal with those who wish to weaken armed forces and how to deal with those who talk with the sponsors of terrorists,” Modi asked. “When it comes to national security, there can be no compromise. We leave no stone unturned in protecting India and destroying forces of terror. When a brave Indian pilot was captured, he was back in record time. The Congress party politicised the issue,” Modi said pointing fingers at the opposition. Taking a dig at Congress bigwig in Tamil Nadu, Modi said while the father (former Union Minister P Chidambaram) was the India’s Finance Minister, his son (Karti Chidambaram) looted the country.